The historical account of certifying teachers in Saskatoon has grown and developed over the course of the last century. Teacher training began where classrooms and instructors were available, and the first permanent building for teacher training, the Saskatoon Normal School, was opened in 1923. Saskatchewan saw rapid growth and expansion in the early 1900s. Pioneering homestead families with young children created a dire demand for teachers in communities. Saskatchewan's pioneer slogan, "A new school every day for twenty years," is paralleled by the need to staff these new schools. To keep these schools open, the Department of Education desperately required teachers. From these humble beginnings teacher training programs were developed and refined. The one room school house gave way to the consolidated school. Classrooms and educational trends diversified to meet the changes in society through the twentieth century and into the twenty first. 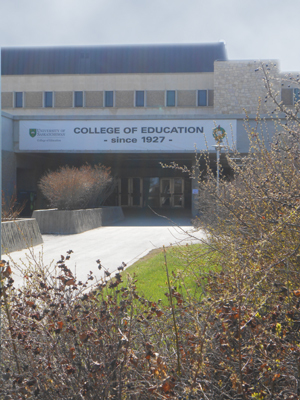 From the early beginnings when the Normal Schools provided teacher training, now the College of Education maintains a professional academic curricula on the University of Saskatchewan campus in Saskatoon. During these early years of settlement in the Northwest Territories trained teachers were recruited from overseas, and eastern Canada normal schools. When there was no teacher available, local pioneer residents with education were requested to provide education services in public school classes. Fledgling school districts relied upon their school inspectors to aid them in procuring a teacher. Additionally, in the late 1800s and early 1900s the community could place a request for a teacher who could provide instruction in a foreign language. Union schools provided early teacher education classes. "The first such classes were offered as “The Science of Teaching” and “School Law”" Horseman Under the 1888 Ordinance of the Northwest Territories, classes were provided wherever there was a two room union school and ten or more pupils desiring teacher training relates Ken Horseman in his article written for the Encyclopedia of Saskatchewan. Teaching inspectors were called upon to provide teacher training, and early union schools in Estevan, Moose Jaw, Moosomin, Prince Albert, Regina, Saskatoon, Yorkton, and Weyburn offered classes to obtain a third class teaching certificate. "A teacher affects eternity; he can never tell where his influence stops." said G.R. Anderson, Principal of the Normal School, quoting Henry Brooks Adams. " Saskatoon Star-Phoenix. June 20, 1946. The early history of the city of Saskatoon began when the scouts for the Temperance Colony Settlement arrived on the shores of the South Saskatchewan River in 1881. Colonists from eastern Canada began settling in 1883. The first permanent school was ready by 1887, and was known as the "Little Stone School", though classes had begun in temporary locations as early as 1884. This was the beginnings of the village of Saskatoon. In 1891, the Qu'Appelle, Long Lake and Saskatchewan Railway Company bridge and railway station on the west side of the river saw the start of a settlement across the river from the original Temperance Colony Settlement. In 1901, this growing community was large enough to incorporate as a village, and took the name Saskatoon. The pioneers on the east side changed the name of their settlement to Nutana. Another group of pioneers settled down also on the west side of the South Saskatchewan River, but across the tracks from the village of Saskatoon. This new community incorporated as Riversdale. By 1896, 258 students were taking Normal School classes in the Northwest Territories, and the first official Normal School was established at Alexandra School on Hamilton Street (the Red School) in Regina, provisional district of Assiniboia, Northwest Territories. Teaching classes moved out of the Regina Union School on Hamilton Street and 11th Avenue (the White School) at this time. The number of public schools established by the turn of the century was 574 which were served by 592 teachers. According to Statistics Canada, the population of The Territories was booming, growing from 56,446 persons in 1881 to 66,799 in 1891, and more than doubling to 158,940 by 1901. In 1905, there were 869 school districts in operation according to Ronald A. Manzer. It was in this self same year, on September 1, that Saskatchewan became a province. Until this date, Saskatoon lay within the provisional district of Saskatchewan, in the Northwest Territories. The growing communities of Saskatoon, Riversdale and Nutana merged together as the city of Saskatoon in 1906. It was during this year, that the number of schools in the province nearly doubled since 1900 coming to a total of 942 schools in existence, with 1,193 teachers serving these schools. Saskatoon was chosen as the site for the University of Saskatchewan in 1909. The initial buildings were contracted out in 1910, the College Building, Saskatchewan Hall student's residence, Agricultural Engineering, Stock Pavilion, barn and Poultry Science building. In 1909, Deputy Minister of Education, W.P. Bate published an article in The Daily Phoenix (Saskatoon's Newspaper) urging students to send in their applications if they desire training at a Normal School in Saskatoon. Applications were received, however the number was below the needed ten applications to warrant local sessions. There was a tendency of the one room school house to expand. Communities rebuilt older schools or moved in additions forming two room union schools or three room consolidated schools. The number of schools in the province climbed to 2,468 school districts by June of that same year. The growth and prosperity of the province showed the rise in population which was seconded by the increase in school districts needed by the burgeoning population. Such an increase in population and the education of its children demanded, as well, an increase in the numbers of teachers available. In the years 1912-1913, the Normal School rented rooms from the Saskatoon Collegiate Institute (later known as the Nutana Collegiate) for classes, this was a temporary location. On August 20, 1912, the Saskatoon Normal School began, with twelve second class student teachers and fifty third class students. In 1912, the University of Saskatchewan also rented rooms from on the third flow of the Saskatoon Collegiate Institute. In 1913, Dr. J.A. Sneel presided as principal of the Saskatoon Normal School.On Campus News A.J. Mather was principal of the Saskatoon Collegiate Institute between 1908-1915, followed by A.J. Pyke. 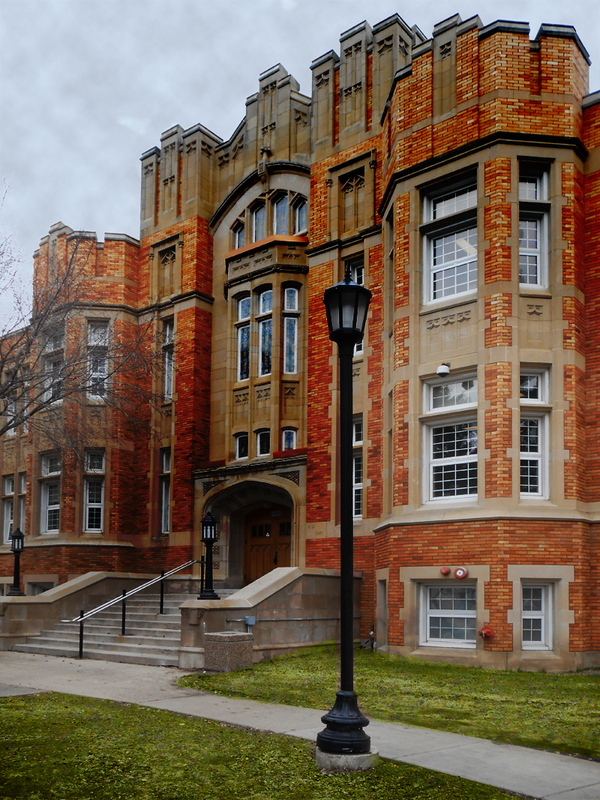 The Saskatoon Collegiate was erected in 1910, and gave up the name Saskatoon Collegiate when Bedford Road Collegiate was constructed in 1923 on the "Saskatoon side" or west side of the South Saskatchewan River according to Eric O. Burt. 55 students from were enrolled for the first session held between August to October, 1912. During this time, President Murray of the University of Saskatchewan provided lectures on the philosophy of education, and Normal School students attended lectures offered to the agricultural students at the U of S as well. "There is one thing lacking in this country ... I would like to see some way to make the teaching profession a real profession - a profession that a man or a woman can spend his or her life at - giving sufficient returns for the labor and brains demanded, and the time and money spent in preparation for it - carrying with it the honor that attaches to other professions, not the mere unwritten honour of work well done, but something tangible and recognized. " ~ Chief Justice Haultain May 31, 1913. Bocking. 1979. 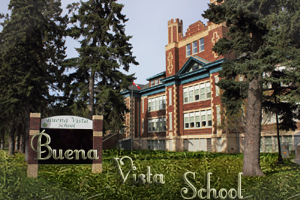 When Buena Vista School opened 1913-1914, the Normal School rented four rooms and relocated to this location in 1914 for two years. The Saskatoon Normal School began as did the Regina Normal School utitlizing temporary locations until a permanent building could be built. It was May 30, 1913 when the cornerstone was laid by Haultain for the permanent location of the Regina Normal School on College Avenue and Broad Street, Regina. It would be another ten years before the Saskatoon Normal School held classes in the Saskatoon Normal School building. Construction began in 1914 on Student's Residence No. 2 in the University Campus. When the building was completed by 1916, it received the name "Qu'Appelle Hall." The University of Saskatchewan converted dormitory rooms on the first floor to house the Saskatoon Normal School. Classes commenced in the new location in 1916. By 1916, the minimum number of persons applying for normal class rose from ten students to 25 persons who indicated a desire to attend third class school sessions. Only fifty students were to be accepted for third class classes in Regina and Saskatoon, however first and second class sessions were also offered in both Provincial Normal Schools in Regina and Saskatoon. St. Thomas Presbyterian church now St. Thomas Wesley United Church. 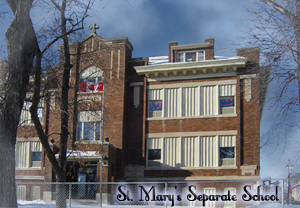 Classes for the Saskatoon Normal School moved again in 1919, St. Mary's separate school, and St. Thomas Presbyterian Church provided space for classrooms. St. Thomas Presbyterian church was constructed at the intersection of Avenue H and 20th Street in 1908, and expanded in the fall of 1911. In 1934, the Riverside Methodist Church on Avenue G and 19th Street (later named Wesley Methodist Church) and the St. Thomas Presbyterian Church both united and became known as St. Thomas Wesley United Church. St. Mary's Community School, now demolished, was designed by David Webster in a Collegiate style in 1913. If 25 students submitted applications for Third Class sessions, then centers at Regina, Saskatoon, Yorkton, Estevan, Prince Albert, Moosomin, Weyburn, Swift Current, North Battleford and Moose Jaw would establish classes for teacher training in addition to classes held at the Saskatoon and Regina Normal Schools. This was a change from the earlier minimum of ten students required to mandate a class at a Union or Normal school. In 1919 discussions arose to the permanent location of the Normal School site, whether the teacher training school should be located on the University of Saskatchewan campus grounds or elsewhere. Discussions ensued between Walter C. Murray (President of the University of Saskatchewan 1908-1937), the Government of Saskatchewan Department of Education, University of Saskatchewan architect David Brown, Saskatoon Normal School board trustees especially Dr. J.L. Hogg, and Dr. George M. Weir Principal of the (Saskatoon Normal School 1918-1924). The first option offered on the University campus consisted of four acres, however, ten acres were requested by the Saskatoon Normal School. At this same time, the University of Saskatchewan was considering requests by the government for a tuberculosis sanatorium and a School for the Deaf. By the spring of the following year, 1920, the decision was made after consideration of several sites, to construct the Saskatoon Normal School of brick and Bedford stone in the gothic architectural stylings overlooking the west side of Saskatoon atop the hill on Avenue A North. While the Saskatoon Normal School building was under construction, the teacher training sessions were held at St. Paul's school on 22nd Street. St. Paul's School had constructed a temporary building on the corner of 22nd street and 4th avenue in 1913 which was replaced by a permanent building in 1926. Prior to this, St. Paul's school held classes in St. Paul's church basement which had served since 1911. The Saskatchewan provincial population continued to swell, reaching 757,510 by the time of the 1921 census count showing an increase of 265,078 persons since 1911, or 54 per cent growth. At this time, there were 538,552 persons residing rurally in Saskatchewan compared to 218,958 in urban centres. This represented an increase of 49 per cent in the rural population since 1911 and showed 66 per cent in urban growth. It was February 12, 1923 when the Provincial Normal School was officially opened in Saskatoon. The cornerstone was laid on May 24, 1921 by Lieutenant Governor, The Honorable H. Newland following architectural plans drawn up by the provincial architect, Maurice W. Sharon. 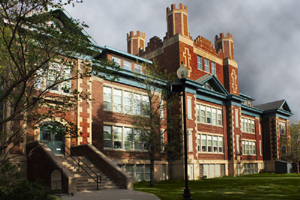 The Saskatoon Normal School was one of the projects undertaken by Saskatoon architect David Webster under the supervision of Sharon. The building opened March 1922 at 1030 Avenue A North (now known as Idylwyld Drive North). Student enrollment during the 1923 school term showed 404 student teachers at Regina Normal School and 335 enrolled in the Saskatoon Normal School. 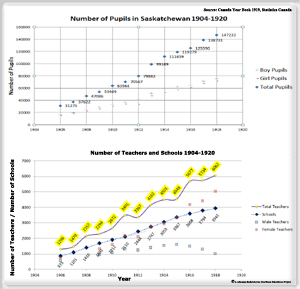 This trend of a higher student teacher population in the southern portion of the province continued in 1924 with 466 student teachers enrolled in the Regina Normal School, with 381 in Saskatoon. The Saskatchewan Correspondence School arose in 1925 to offer classes for secondary schooling supplementing the province's seven initial collegiate institutes. "The purpose of education is to fit the soul of the child. No system of education can give an education to a child. He must get it for himself. All we can do is to provide the facilities for so doing and we never must lose sight of this fact; that the purpose of education is not to make people farmers or mechanics, not to keep them in any particular walk of life. The objective is to see the boy and girl gets the facilities for the development of his moral nature, intelligence and physical nature. Let him develop his intelligence so he may know; give him the moral training so that he can do properly; house that spirit in a body that is clean and sound. This is just as good for the non-English speaking people as it is for the English speaking people." ~ Honourable S. J. Latta Minister of Education The Morning Leader. Jan. 15, 1926. The large number of students applying to the Normal School for admission resulted in additional criteria for acceptance and a higher competitive admission standard. To be accepted in 1926, students applying for classes must submit diplomas and certificates from Saskatchewan institutions attesting to their standing. The Moose Jaw, Weyburn, Estevan, Moosomin, Yorkton, and Prince Albert centers were to provide special sessions for third class teacher training if there are a minimum 25 students registering at each local rural center. In 1927, the Moose Jaw Normal School opened for teacher training sessions. The staffing at the normal school consisted of permanent teachers along with school inspectors during the winter months. The school inspectors brought practical lessons and how to overcome problems faced directly in the country school. Serving at the Normal school, the inspectors kept in touch with the latest advances in education which they shared on their visits to the one room school districts. Following Dr. Huff, Principal Joseph A. Snell, M.A. LL.D. was appointed the principal of the Saskatoon Normal School serving the years around 1927 and 1929. "I am not properly qualified to advise farmers as to the education of their sons, but being country born and bred I sometimes date to think what I should like my school education in the country to be if I had the privilege of living my life over again....I should like that there should come to me a leader or teacher - call him or her what you will - who could lift me out of my littleness, my narrowness of vision, my wrong conceptions, my crudeness in thought and manner, and make me able to appreciate the true, the beautiful and the good, make me able to understand the beauty and opportunity in my own environment and, above all, anxious to live and serve with the great and good of all time as my models and inspiration. I should not care to hear about crops and stock and poultry all day long. 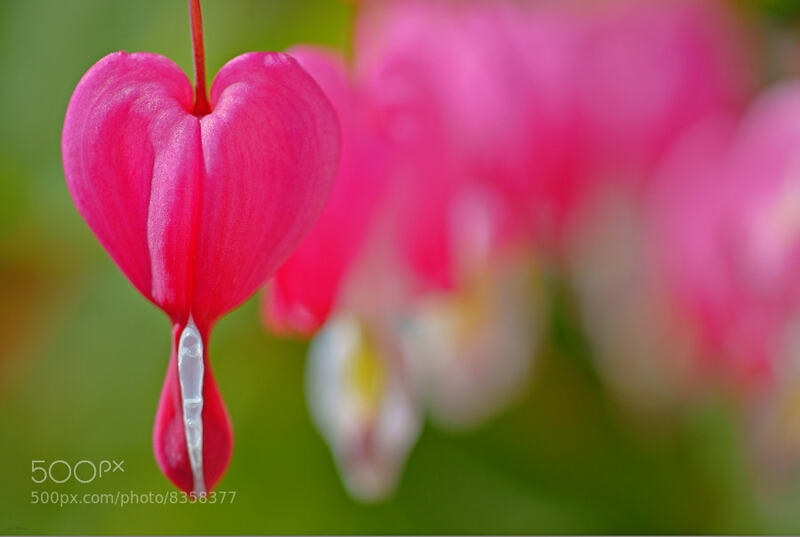 Virtue is more to be desired that prize stock and a happy home than a good bank balance. " ~ A farmer's letter quoted by the Honourable S. J. Latta Minister of Education The Morning Leader. Jan. 15, 1926. According to Karen Briere, "the College of Education with practice schools became a realty in 1927 when a School of Education was established under the College of Arts and Sciences." In 1928, the University of Saskatchewan established the College of Education. 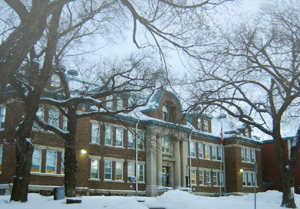 The Saskatoon Normal School remained under the jurisdiction of the provincial Department of Education. Mr. R. W. Asseltine as the Principal of the Saskatoon Normal School was quoted for his memorable speeches during his tenure 1930-1934. 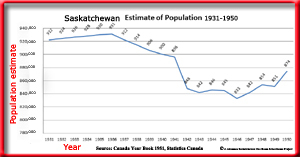 Saskatchewan recorded a growth in population in the decade 1921-1931 of 24.33 per cent reaching a population count of 921,785. The rural population was enumerated at 630,880 persons, with the urban centres at 290,905, over this decade, the rural areas showed a growth of 17% and the urban centres of 33%. Over the year of 1928, there were 4,489 more students enrolled in primary and secondary schools over 1927. Elementary schools grew from 211,599 pupils to 215,968, an increase of 4,369, high schools increased by 120 pupils. 51 new school districts formed over the 1927-1928 school year bringing the total to 4,826 in the province, (this number includes the eight Protestant and 24 Roman Catholic separate schools). As the new year began in 1931, 7,619 pupils were recorded increasing by 140 students over the previous year. The enrollment broke records held for student population in Saskatchewan. 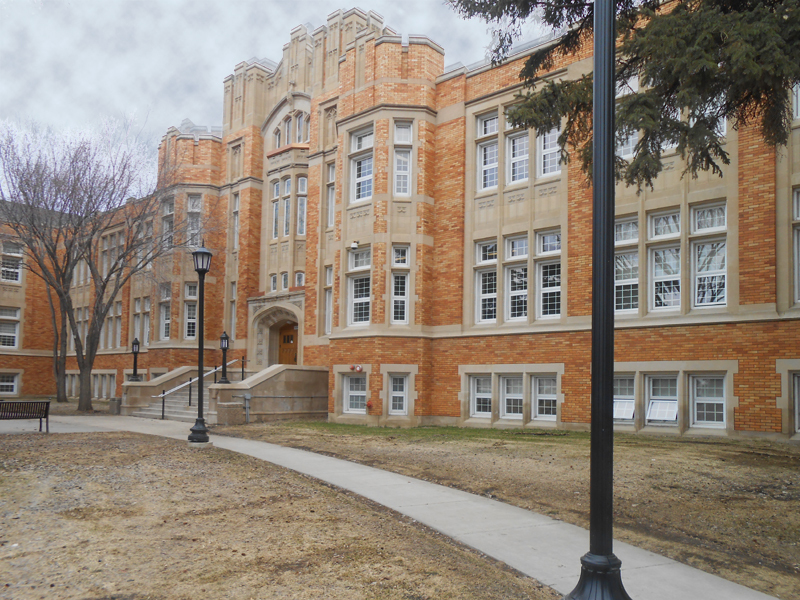 For the Saskatoon Normal School alone, the 1932-1933 school session recorded 284 pupils enroled and the following year 1933-1934, enrolment dropped to 208 registrants. The development of character is the supreme task and privilege of the training school of today. The future of civilization will depend upon human beings who know social righteousness as well as scientific truth. Enlightenment without ethics is a social menace and an educational fraud." Dr. G.M. Anderson, Principal Saskatoon Normal School.Saskatoon Star Phoenix June 22, 1951. The number of school districts increased rapidly across the province with the influx of settlement. By 1937 Manzer reports 5,1476 school districts, an exponential increase of 590%. Examination results following the Normal School sessions were published in the local newspaper announcing the names of those students who successfully earned their interim first class teaching certificate, second class certificate or Third Class Licenses. "The ideal of the Normal School...was to give the students some idea or ideal of the teaching profession and to help them build up the correct professional attitude." Saskatoon Star-Phoenix. May 15, 1933. Seeley spoke to the advantages of converting rural one room school houses into larger school units enumerating several benefits; among them, the "ability to adjust teachers more wholesomely to the life of the community; elimination of the "army of amateurs" who experimented on the lives of children and provision for the possibility of better supervision. "Saskatoon Star-Phoenix. October 4, 1938. The school term over the years 1939-1940 included 344 student teachers enrolled for teaching sessions at Saskatoon, 272 at Regina and 211 at Moose Jaw. In the summer of 1940, classes were relocated to Lakeview School in Regina, as the Regina Normal School was taken over for military purposes. However, classes proceeded as usual at Saskatoon and Moose Jaw Normal Schools. Over the school term 1940-1941 there were 877 student teachers enrolled for teacher training classes. The decade of 1931-1941 showed the first signs of a dramatic population shift from rural areas to urban centres. Rurally, 600,846 were enumerated, compared to 995,146 representing a negative trend of 5 per cent rurally since 1931, and a huge 242 per cent growth to the urban centres over the decade. To compare the rural and urban populations since the beginning of the century, rurally Saskatchewan expanded from about 74,000 persons in 1901 to about 601,000 in 1941 a growth of 715 per cent, whereas, the urban centres swelled from 17,550 to 995,146 showing an increase of 5,570 per cent over this same 40 year time period. "We can't afford to neglect our children, ...They are our greatest natural resource and we neglect them at our own peril and the peril of the future." ~ Professor Carlyle King. Saskatoon Star Phoenix Dec. 2, 1942. According to Professor, King, there were five problems in the educational system, "the inability of many school districts to finance rural schools on a decent educational standard, inadequate facilities and rapid deterioration of rural schools, inadequate teachers' salaries and scandalous arrears of those salaries which were forcing teachers to other fields, inequality of educational opportunity and the hopeless inadequacy of the present course of studies, particularly in high schools, to fit the student for modern living." Saskatoon Star Phoenix Dec. 2, 1942. In the summer of 1941 the Saskatoon Normal School officials surveyed vacant public school space for the continued operation of the teacher training classes in the event that the Normal School building is given to the Defence Department. The Normal School gave up its building on Avenue A North (Idylwyld Drive North) to the British Commonwealth Air Training Plan, and the first class of the Initial Training School (ITS)#7 were held December 8, 1941 in Bedford Road Collegiate. 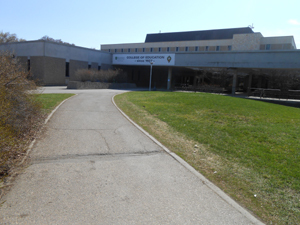 The Normal School location was chosen as the site of the ITS administration office and Royal Canadian Air Force R.C.A.F. recruit dormitories. The Normal School and Bedford Road Collegiate were supplemented by new buildings beside the Normal School for additional training purposes. Enlistment in the war effort drained the provincial educational staff of personnel. Summer teacher training classes were offered to address the teacher shortage. A huge enrollment of 800 students registered for one of these sessions. During this time, Lorraine Blashill, relates that the School Board made accommodations at Wilson School for the Normal School sessions offered by the Department of Education. 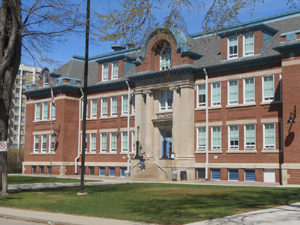 To further accommodate the war effort, students from Wilson School were then themselves relocated to North Park or King Edward Schools. Wilson school, in a new 8 room building, had opened for classes in the fall of 1928 had served the City Park area. Erected on Duke Street and located between Seventh and Eighth Avenue Wilson replaced wood frame school houses. North Park school was located on the corner of Balmoral Street and 9th Avenue. King Edward school built in 1904 by R.W. Ca swell was located in Saskatoon's down town (on 25th Street at the corner of 6th Avenue) six blocks from Wilson School. Used for public school classes, King Edward School was sold in 1911 and served as Saskatoon's city hall, and the second Kind Edward built. Even in these new temporary accommodations, the school year of 1941-1942 showed an enrollment of 950 students taking normal school sessions in the province of Saskatchewan, and 486 the following year, 1942-1943. The next school term showed a drop in student teachers electing to take teacher training with only 450 student teachers attending classes. Education Minister Woodrow Lloyd announced that the Regina Normal School was to close in the fall of 1944 due to declining student enrollment. The Saskatoon and Moose Jaw normal schools remained open to continue teacher training services. In the 1945-1946 school term, the Saskatoon Normal School had an enrollment of 617 student teachers, 76% were women. During this time period, it was estimated that there were in excess of 2,500 teaches with temporary certificates teaching in the province of Saskatchewan. During the second world war, a four-year undergraduate program was designed by the College of Education. Although teacher-training was conferred to universities across Canada, the declaration of war in 1939, put many educational policies and procedures of advanced education in the background. Military training, scientific developments and research into social problems were brought to the forefront for post-school education. "Education....is not for ourselves. It is for the training of human personality to serve the community....You will by your example, create the moral force of human character, the basis of society." Reverend A.B.B. Moore Principal-elect of St. Andrew's College at the 1946 Saskatoon Normal School graduation. Saskatoon Star Phoenix June 20, 1946. Teacher training standards were raised to a two year minimum to receive certification, the classes could be taken at either of the Normal Schools or the University of Saskatchewan, College of Education. Classes could be shared between the two institutions, with a year taken at the Normal School, followed by a year at the University. In the fall of 1948, the Moose Jaw normal school had 220 enrolled, and the Saskatoon normal school 220. Students were trained for the 38 week course rather than the six week short course, as there were already study supervisors in the school districts filling in for the teacher shortage. Students graduating from the 38 week course earned interim first-class certificates. In comparison, the University of Saskatchewan's College of Education showed an enrollment of 400 students, 20 per cent less than the previous year. "The mediocre teacher tells. The good teacher explains. The superior teacher demonstrates. The great teacher inspires. ~William Arthur Ward. Edudemic 2012. At the Saskatoon Normal School convocation in 1951, 75 percent of the graduates were women of the 348 receiving graduation certificates. Concern was raised over the number of teachers available in the teaching profession, if the shortage was due to matrimony along with social and economic conditions. Dr. Steinn W. Steinson (1919-1972) followed Anderson as principal of the Teachers college in Saskatoon. Graduating from the University of Saskatchewan in 1922, Steinson went on to receive his masters and doctorate in education at the University of California, Los Angeles (UCLA). He began as principal of the Saskatoon Teachers College in the fall of 1954 before leaving to serve at the Teachers College in Regina in 1961. "You need never apologize for being a teacher. You have set your feet on the path chosen by many of the world's truly great men. ... The teacher takes the living mind and moulds it." ~ Lorne F. Titus Chief superintendent of Saskatchewan schools. "Teacher's College" was the new name given to the provincial normal schools in 1953. Students received teaching education rather than teacher training. There was much call to re-open the Regina Normal School to assist the Moose Jaw and Saskatoon Teacher's Colleges with teacher education classes. The Regina Normal School building on College Avenue and Broad Street re-opened its doors in 1957 under the new name, the Regina Teacher's College, however this same year, the Moose Jaw Teacher's College closed its doors. "You are handling the most precious commodity in the universe, human personality." ~ Premier T.C. Douglas. By 1960, the Saskatoon Teacher's College recorded an enrollment of 523 student teachers. Even though there were more stringent enrollment requirements for students registering due to the high numbers of students submitting applications, 584 students attended the Saskatoon Teacher's College during the 1961-1962 school year. Across the province, the larger consolidated schools with many classrooms had replaced the rural one room schools serving districts approximately an area four miles square. It is essential for the children to get better education, and we adults must practice what we preach, otherwise, no change will take place in our society." ~ Dr. W. Steinson, principal of the Saskatoon Teacher's College. In 1964 both the Saskatoon and the Regina teacher's colleges closed, and all teacher education came under the jurisdiction of the University of Saskatchewan. The architectural design for the original Normal School building accommodated 360 students. And although the Saskatoon Teacher's College now came under the University of Saskatchewan's College of Education, classes continued in the building at 1030 Avenue A North. The new name of the Saskatoon Teacher's College became University of Saskatchewan Avenue A campus and the Regina Teacher's College became University of Saskatchewan ~ Regina Campus. The building on Avenue A in Saskatoon remained in use until the University of Saskatchewan constructed an education building on campus. The August 22, 1964 Saskatoon Star Phoenix reported that student teachers wishing to teach grades one through nine could achieve their Interim Standard "A" certificate after one year of education at either of the two campuses which were now amalgamated under the University of Saskatchewan. Certification of teachers remained with the Department of Education, and teacher education was placed in the domain of the University of Saskatchewan. During the 1964 school year, 396 students received classes from the Avenue A Campus, and 6,927 applicants applied for classes in the 1963-1964 school term. During this same year, 1,0003 students were expected. 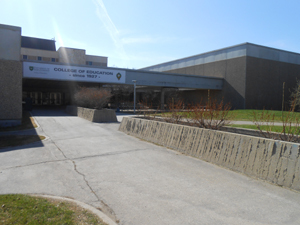 Between 1967-1970, the Education Building was constructed on the University of Saskatchewan campus, with the first classes held in the spring of 1970. This new building was constructed to serve "2,500 university students, 200 graduate students, and 120 faculty members. "The Phoenix Sept 22, 1984 Teaching requires a post-secondary Bachelor's Degree, such as a Bachelor of Education to be qualified as a teacher. "This building was named the E. A. (Fred) Davies Building on February 10, 1986 by the Honorable George McLeod, Minister of Advanced Education and Manpower. This building is dedicated to the honour of E.A. (Fred) Davies, pioneer of technical education in Saskatchewan since 1941. In 1947, he became the principal of the Canadian Vocational Training School, an early vocational centre located on the present campus of Kelsey Institute. In 1963, Mr. Davies accepted the position of Consultant to the Principal of the newly opened institute. After his retirement from post-secondary education at the age of 71, Mr. Davies was ordained as a deacon and served for another twelve years as the priest of St. Luke's Church in Saskatoon. In 1975, Fred Davies was honoured as Saskatoon's "Citizen of the Year" in recognition of his outstanding contributions to education, community organization and church activities. This building, appropriately renamed in his honour, has served Saskatchewan residents since 1923, first as the Normal School and later as the Teacher's College. ~Plaque installed within the E.A. Davies Building along with the portrait of E.A. (Fred) Davies. A reflection on the progress of teacher training and teacher education in Saskatoon, honours the era of the Saskatoon Normal School, and embraces the remarkable journey to the College of Education at the University of Saskatchewan. As Dr. Fast, Director of Education says, the schools of today are building on the tradition of excellence begun by those of yesterday, preparing new generations for the challenging and changing world they will soon enter. "Blashill p. 155 Every generation, since time immemorial, has passed on its knowledge, traditions, values, skills and beliefs its stock of values, traditions, methods and skills to the next generation. The role, curriculum, and course of study for the teacher varies, however the main thrust; to facilitate student learning by a method of instruction remains the same. The normal schools provided the pioneering rituals, traditions and standards, nay the "norms" for teaching behaviours, specialized education, values, and code of ethics to maintain the teacher in good professional standing. Teachers colleges provided teachers with the ability to successfully meet or exceed the public expectations to educate the nation's children. "The College of Education is the second largest college at the University of Saskatchewan and has graduated over 30,000 students in its 80-year history. To become an educator through the U of S College of Education is to join a tradition of excellence in teaching and learning. "~College of Education 1994-2009. "In the long story of the struggle of mankind to fit its youth better for the activities of life, there has been a great variety of aims, and that the most common characteristic in all these was the tendency to throw the whole emphasis on some one factor. At oem time it was the acquisition of knowledge and information; at another the supreme importance lay in the development of the individual, then the welfare of society and the production of workmen skilled in some particular vocation by means of some specific study. Table 3. 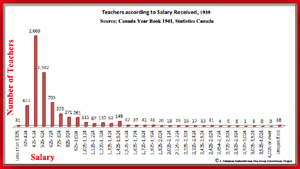 Teachers according to Salary Received in Saskatchewan 1939. 11 x 17 Heritage Sites City of Saskatoon. Community Services. Planning Department. Documents. Mapping. Quote"City of Saskatoon Heritage Properties: ...Holding Bylaw Properties. The Normal School. 1030 Idylwyld Drive North." unquote Date accessed May 15, 2013. Adamson, Julia. From potential to realty ~ The Regina Normal School. With additional notes regarding the Regina College. University of Saskatchewan ~ Regina campus. University of Regina. May 9, 2013. Date accessed May 16, 2013. Adamson, Julia. The Drastic Shortage of Teachers in Saskatchewan's History. A small sampling of Teacher wanted ads. Saskatchewan One Room School Project. Saskatchewan Gen Web. September 28, 2012. Date accessed May 16, 2013. Adamson, Julia. Schools Close. Lack of Teachers in Saskatchewan's History. September 29, 2012. Date accessed May 16, 2013. Adamson, Julia. Saskatchewan School Inspection of the One Room Schoolhouse. September 2012. Date accessed May 16, 2013. American describes Teaching Conditions in State of Kansas. Less Training needed, hence wages are relatively low in rural districts, visitor in Saskatoon declares. Saskatoon Star-Phoenix. December 29, 1939. Page 9. Google News Archive. Date accessed May 17, 2013. Appointed. Charles W. Downer. (Saskatoon Normal School Librarian) Saskatoon Star-Phoenix. July 4, 1931. Google News Archive. Page 7. Date accessed May 20, 2013. Anderson Leaving Teachers' College, Steinson Successor. Saskatoon Star-Phoenix. May 8, 1954. Page 3. Google News Archives. Date accessed June 4, 2013. Asks More Stress on Culture Values. Seeley Suggests Way in Which Youth Can Get Increased Joy From Life. Saskatoon Star-Phoenix. November 29, 1937. Page 3. Google News Archive. Date accessed May 20, 2013. Author Bio. Asseltine, Robert Whiting. 5663: story of Lodge Progress, no. 92, G.R.S., A.F. and A.M., Saskatoon, Saskatchewan, April 15th, 1912, April 15, 1933 The . . Quote"Asseltine, Robert Whiting (1870-1953). Teacher in Ontario; to Saskatchewan, 1911; inspector of schools at Rosetown; on staff of Saskatoon Normal School, 1918-1927; principal of Moose Jaw Normal School, 1929-1930; principal of Saskatoon Normal School, 1930-1934 (Saskatoon Star-Phoenix, March 24, 1953)." unquote 2003-2009. University of Alberta. Date accessed May 17, 2013. Attendance is up at Normal School. Accommodation taxed to limit as 325 begin training for teachers. Saskatoon Star-Phoenix. September 4, 1934. Google News Archive. Date accessed May 16, 2013. Blashill, Lorraine (1982). In Lorraine Blashill. From a little stone school... A story of Saskatoon Public Schools. Modern Press Ltd. p. 40, 68, 99986-87. Bocking, D.H. for the Saskatchewan Archives Board. Saskatchewan A Pictorial History. Western Producer Prairie Books. Saskatoon, SK. ISBN 0-88833-017-0 BD ISBN 0-88833-042-1 pa. page 83. r Books and Authors. More Success come to Frances Shelley Wees, To Whom Saskatoon is "Home-Town." Saskatoon Star-Phoenix. January 30, 1954. Quote"She came back to Saskatoon for a year at the Normal School which was held for the first few months in St. Paul's School until the new building was ready..." unquote Google News Archive. Date accessed May 20, 2013. Building Progress in School District. The Saskatoon Phoenix. June 30, 1927. Page 82. Google News Archive. Date accessed May 20, 2013. Charyk, John C. The Little White Schoolhouse. Volume 1. Western Producer Prairie Books. Saskatoon. ISBN 0-919306-08-X. Pages 100, 170, 193, 228-229 237. 1977. Briere, Karen. College of Education established in 1927. The Phoenix. September 22, 1984. Google News Archive. Date accessed May 17, 2013. Burt, Eric O. Saskatoon Schools: What's in a Name? Schools Recognize Civic Personalities. Teacher arrived with harvest. Public school draws name from war hero. Vanier School departure from Tradition. The Phoenix. September 8, 1984. Page 63. Google News Archive. Date accessed May 17, 2013. City of Saskatoon Municipal Elections, 1959. [school addresses] Saskatoon Star-Phoenix. October 29, 1959. Page 31. Google News Archive. Date accessed May 17, 2013. The City of Saskatoon - Municipal Manual 2011 Compiled by the Office of the City Clerk. 2011. Quote"1910 Nutana Collegiate was erected...1921 May 24 Cornerstone Provincial Normal School was laid by the Lieutenant Governor, The Honorable H. Newland...1923 February 12 Provincial Normal School was formally opened...1931 Technical School was completed... 2004 June 15 Demolition work began on the Gathercole Building (originally Saskatoon Technical Collegiate) as part of the new South Downtown riverfront development..." unquote Date accessed May 15, 2013. Clark, Greg. Jean Stangoe on Saskatoon Normal School Team (second from rt seated) 1928-29, Stangoe family photos. Flickr photo sharing. Date accessed May 15, 2013. Classrooms in Lakeview School Made Ready for Normal School. The Leader-Post August 5, 1940. Google News Archives. Date accessed May 16, 2013. College of Education ~ University of Saskatchewan. Prospective Undergraduate Students. 1994-2008. Date accessed May 26, 2013. College Principal Guest Speaker. Saskatoon Star-Phoenix. March 15, 1961. Google News Archive. Date accessed May 17, 2013. Colleges turning away applicants. The Leader-Post. September 9, 1961. Page 32. Google News Archive. Date accessed May 17, 2013. Delainey, William P., JOhn D. Duerkop, and William A.S. Sarjeant. Saskatoon, A Century in Progress. Western Producer Prairie Books. Saskatoon. ISBN 0-88833-090-1 bound, ISBN 0-88833-089-8 (pbk.) Pages 69, 72, 107. 1982. Dr. Huff Heads Normal School in Saskatoon. Appointed in Succession to Dr. George M. Weir, who has gone to British Columbia. The Morning Leader. December 13, 1923. Google News Archive. Date accessed May 16, 2013. Dunn, Jeff. Brief History of Teacher Education. Edudemic. November 16, 2012. Date accessed May 26, 2013. École St. Paul School: History/L'histoire Archives Greater Saskatoon Catholic Schools SCS. Quote"The original St. Paul’s School was opened in the basement of St. Paul’s Church in September 1911. By 1913, enrollment had reached 240 students and classroom space was a problem. A temporary building was erected near 22nd Street and 4th Avenue and finally in 1926, St. Paul’s School was built on the 22nd Street site. This school continued to grow and it eventually became a collegiate for Catholic boys. In 1954 with enrollment growing, St. Paul’s North was built on our present site, 1527 Alexandra Avenue...." unquote Date accessed May 20, 2013. Education absorbs 66 per cent of taxation dollars. 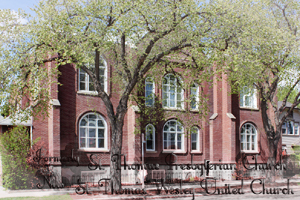 Saskatoon's original school now permanently located on university campus (image.) Saskatoon Star-Phoenix. Page 37. May 19, 1966. Google News Archive. Date accessed May 17, 2013. Educationist's Present Views to Commission. Thomson, Seeley and Quance all in favor of Large Units of School Administration. Saskatoon Star-Phoenix. October 4, 1938. Page 3. Google News Archive. Date accessed May 16, 2013. Education thought everybody's business. Saskatoon Educational Centre of Province: University City's Biggest Industry: School Construction Persists. Saskatoon Star-Phoenix. June 4, 1960. Page 70. Quote"No wonder education is big business in Saskatoon and the favorite slogan of a well-known educator, Dr. S.R. Layock, former dean of the College of Education, "Education is Everybody's Business" is as timely today as it was years ago. unquote Google News Archive. Date accessed May 17, 2013. Educationalist got start here. Saskatchewan Men among winners and losers at coast. Provincial Treasurer Beaten, Once of Wolseley, Pooley of Grenfell. The Leader Post. November 3, 1933. Page 2. Google News Archives. Date Accessed May 20, 2013. Emphasizes Great Task. Teachers will determine future of society, says Lazerte. Saskatoon Star-Phoenix. October 8, 1938. Google News Archive. Quote"The teacher must be afforded security of tenure together with a salary commensurate with the task....Teachers...were the people who could be trusted to form educational policy and to carry that policy to a successful conclusion. In Alberta, ... minimum salary for teachers had been arrived at and compulsory membership in a strong organization provided." unquote Date accessed May 16, 2013. Enrollment in Schools Falling Off. October Sees 368 Fewer Pupils than Same Month in 1941. Oulton Reports. Figure, However Shows Increase over Sept.; One Truant Case. Carlyle King Finds Five Faults in School System. Saskatoon Star-Phoenix. December 2, 1942. Page 3. Google News Archive. May 20, 2013. Enrollment up for January. Superintendent's Report Shows New Record Created for Attendance. The Leader-Post. February 11, 1931. Page 6. Date accessed May 24, 2013. Examination Results of Normal School. The Morning Leader. July 19, 1921. Google News Archive. Date accessed May 16, 2013. Expect 208 for Normal Classes. Fewer Applications Made for Training, Principal Asseltine Notes. Saskatoon Star-Phoenix. September 1, 1933. Page 3. Google News Archive. Date accessed June 4, 2013. Expect 450 to Enroll in 1st Year Education. Saskatoon Star-Phoenix. Page 2. Google News Archive. Date accessed May 17, 2013. Final Function at Normal School Saskatoon Star-Phoenix. June 4, 1935. Google News Archive. Date accessed May 16, 2013. Foght, Harold W. A Survey of Education, 1918. The Province of Saskatchewan Canada. A Report. Government of the Province of Saskatchewan. Regina. J.W. Reid King's Printer. 2005. Transcribed online by J.D. King 2008. Quote "The normal school is housed temporarily in one of the residences on the grounds of the University of Saskatchewan, at Saskatoon. Several converted dormitory rooms. In Saskatchewan, ... the normal school term ranges from 10 weeks for Third Class teachers to 16 weeks for Second and First Class teachers...The number of classroom periods per week for each instructor average 19.9 at Regina but only 13.8 at Saskatoon. This is because all “first class” and “second class’ students recite in their original groups. There may be thus 9 or 10 in the “first class” and 50 or more in the “second class.” The average number of students per class in the two schools is 50 and 42 respectively. "unquote Date accessed May 16, 2013. Gallen, V. The Development of the Teaching Profession in Saskatchewan. Noonan, Brian W.; Dianne M. Hallman, and Murray Scharf; editors. The History of Education in Saskatchewan: Selected Readings Volume 47 of Canadian plains studies. Contributors	Brian W. Noonan, University of Regina. Canadian Plains Research Center. Edition	illustrated. Publisher	University of Regina Press, 2006. ISBN	0889771901, 9780889771901. Digitized online by Google Books. Quote "The establishment of a four-year Bachelor of Education program at the University of Saskatchewan in 1946 was recognized as the STFs [Saskatchewan Teacher Federation] "baby"....However, ...even then it was possible for individuals to enter teaching through a six-week "short normal course" offered by the department of education....The dozens of normal schools that operated around the province in the first half of the twentieth century were slowly consolidated into larger institutions that produced teachers on a provincial rather than a regional basis. In 1959 a major step towards consistency was taken when entrance requirements were standardized for the province's normal schools and colleges of education..."unquote Page 150. Date accessed May 16, 2013. The Glenbow Museum > Archives Photographs Search Results. Quote "Normal School students teacher's residence, Saskatoon, Saskatchewan. Date: [ca. 1930]..."unquote Date accessed May 16, 2013. Education Building Campus Buildings University of Saskatchewan. Date accessed May 16, 2013. Education of Teachers. Edmonton Journal. July 19, 1961. Page 4. Quote"Politicians who imagine they are meeting their responsibilities by filling classrooms with short-course trainees form one obstacle. Officials of departments of education, who follow the instructions of such political superiors without protest, form another. " unquote Google News Archive. Date accessed May 17, 2013. Fall Normal Term opens on Sept. 3. Sessions will be held at three centres until June 5, 1931. Saskatoon Star-Phoenix. March 7, 1930. Page 7. Date accessed May 20, 2013. Gidney, R.D. and W.P.J. Millar. How Schools Worked: Public Education in English Canada, 1900-1940 Volume 224 of Carleton Library Series. Authors	R.D. Gidney, W.P.J. Millar. Publisher	McGill-Queen's Press - MQUP, 2012. ISBN	0773587306, 9780773587304. Quote"In 1930, for example, at the Regina and Saskatoon normal schools, 30% of the students were of non-British origin, and at Moose Jaw normal school in 1929, the figure was 39%. By 1937 the principal of the Saskatoon normal School was reporting that 45% of the students were of non-English origin....Some returns from the Saskatoon normal schools during the interwar years, which reveal that a majority or near-majority came from farm families and many of the rest from small shopkeepers, skilled artisans', and even labourers' families. Take for example, the Saskatoon normal school in 193:0: 49% of its 383 students' fathers were listed as farmers, 11% as "skilled mechanic", 10% as "storekeepers", 9.4% as "executive," 6.5% as "unskilled labourer," 5% as "professional," and 6% as "deceased. "...Fifteen years later the principal of the Saskatoon normal school estimated that "over 40% of the teacher's - in - training had no experience of rural schools." He went on to point out, moreover, that of those who had attended rural schools, larger numbers had received only a part of their schooling in ungraded classrooms and at ages where the experience would leave few impressions. " unquote Page 140, 141 Digitized online by Google Books 2012. Date accessed May 15, 2013. Graduation Staged At Normal School. Seeley Sees Indication of Sound Foundations of British Empire. Saskatoon Star-Phoenix. June 3, 1939. Google News Archive. Date accessed May 16, 2013. Hallman, D. Telling Tales in and out of school: Twentieth-century Women Teachers in Saskatchewan. Noonan, Brian W.; Dianne M. Hallman, and Murray Scharf; editors. The History of Education in Saskatchewan: Selected Readings Volume 47 of Canadian plains studies. Contributors	Brian W. Noonan, University of Regina. Canadian Plains Research Center. Edition	illustrated. Publisher	University of Regina Press, 2006. ISBN	0889771901, 9780889771901. Digitized online by Google Books.Quote "Rudimentary teacher training was first conducted in union schools and gradually became formalized in normal schools in Saskatoon, Regina, and Moose Jaw... An increasing demand for secondary school education facilitated the eventual establishment of the College of Education at the provincial university in 1928. The mandate of the college was to prepare its students for teaching in the high schools and collegiate's, and to conduct research in education. The program of the college was open only to students who had undergraduate degrees. In 1946-47, the College of Education developed a four-year undergraduate program. However...the government insisted that intending elementary teachers take their first year of training at a normal school. ...The names of the two remaining normal schools were changed in 1953 to teacher's colleges, and "teacher training" became "teacher education." Eleven years later both teacher's colleges closed, and all teacher education moved to the University of Saskatchewan....Ina Jones Jorstad remembered her preparation at the normal school in Moose Jaw in 1930, as consisting of classes in "reading writing, literature, math, geography, health, home economics, physical education, psychology, drama the arts and...The Regina Normal School closed after World War II. It re-opened as Regina Teacher's College in 1957, the same year the Moose Jaw Teacher's College closed (from Campbell, Reflections of Light, 107-109; 151-2. "unquote Page 150. Date accessed May 16, 2013. Heide, Rachel Lea and Ross Herrington. British Commonwealth Air Training Plan. The Encyclopedia of Saskatchewan. Canadian Plains Research Center. University of Regina. 2006. Quote No. 7 ITS [ Initial Training School had its living quarters and classrooms in the Saskatoon Normal School and Bedford Road Collegiate. "unquote Date accessed May 16, 2013. History of Education, of Teacher Training and Teaching. Educational History of Teacher Education and Training of Professional Teachers. Mirrored October 2009. Oocities. Date accessed May 26, 2013. A concise Western history of education, educational reforms and training of qualified school teachers Philosophies, theories, systems-methods of teaching professional educators -social status of a teacher History of Nutana Nutana Collegiate. Saskatoon Public School Division. Quote "In 1912, The Public School Board rented two basement rooms and the Normal School also rented a room, to be used for teacher training. In January 1913, Principal Mather wrote to the Collegiate Board that the entire school was needed for collegiate students. He reported that he had to convert the Reading Room into a classroom and one of the cloakrooms into a typing room. The four classrooms being used by the Normal School would be needed by September to accommodate an anticipated enrollment of 400 students. The Normal School was asked to vacate, but remained for another year because of difficulties in finding an alternate location. "unquote Date accessed May 15, 2013. Homeroom Timeline 1920s Edited by Patrick A. Dunae. Vancouver Island University VIU history department. April 3, 2011. Quote "The University of British Columbia establishes a Teachers; Training Course "for the purposes of giving professional training for students intending to become [secondary] school teachers." Dr. George M. Weir, principal of the Saskatoon Normal School, is appointed professor of education and director of the new pogrom. "unquote Date accessed May 15, 2013. Honeywood Heritage Nursery. Dr. A.J. (Bert) Porter. Quote "They homesteaded south and west of Parkside in the Honeywood school district. Bert, as he was known, attended public school in the Honeywood rural school house, high school in Moose Jaw and took a 6 week course in the first class of the new Saskatoon Normal School in 1919. He went back 3 years later for a 6 month course and graduated from Normal School in 1922" unquote Date accessed May 15, 2013. Horsman, Ken. Education The Encyclopedia of Saskatchewan. Canadian Plains Research Center. University of Regina. 2006. Quote The 1888 Ordinance that provided grants for Union high schools also permitted Union Schools to set up Normal departments for the training of teachers. The Moose Jaw Normal School opened in 1927. "unquote Date accessed May 16, 2013. Howe, Constance Nina and Laurence Wayne Prochner editors. Early Childhood Care and Education in Canada. Edition	illustrated. Publisher	UBC Press, 2000. ISBN	077484129X, 9780774841290. Quote "Saskatoon Normal School Founding Date 1912. In 1952, while the province still retained its normal schools, a four-year undergraduate program for elementary and secondary teachers was opened at the University of Saskatchewan. ...Initially, normal school admission standards included a minimum age requirement (sometimes as young as fourteen, but generally sixteen years) and the successful passing of an entrance examination, rather than the completion of a particular level of prior schooling. A large proportion of the normal school curriculum was devoted to upgrading student knowledge in the subjects that they would be expected to teach, such as grammar, mathematics, geography and science. "unquote Page 69. Date accessed May 15, 2013. Education in Moral Values Stressed to Normal Students. School Board Adopts Policy on Classroom Collections. Saskatoon Star-Phoenix. June 22, 1951. Page 3 and 6. Google News Archive. Principal G.R. Anderson. Date accessed May 16, 2013. Fall Sessions Normal School Are Announced. Courses Open in September for Training First, Second Class Teachers. The Leader-Post. April 22, 1933. Google News Archive. Date accessed May 16, 2013. Ingles, Ernest Boyce. Bibliography of the Canadian Prairies to 1953. G - Reference, Information and Interdisciplinary Subjects Series. Editors	Ernest Boyce Ingles, Bruce Peel, Norman Merrill Distad. Contributors	Ernest Boyce Ingles, Bruce Peel, Norman Merrill Distad. Edition	3, illustrated, revised. Publisher	University of Toronto Press, 2003. ISBN	0802048250, 9780802048257. Quote"Biography of Bruce Peel. Peel spent a year in 1936-1937 earning a teacher's credential at the Normal School in Moose Jaw. This was a reliable choice to guarantee a career, or at least a job to fall back on in those hard times....Author index Asseltine, Robert Whiting 1870-1953 Teacher in Ontario; to Saskatchewan, 1911; inspector of schools at Rosetown; on staff of Saskatoon Normal School, 1918-1927; principal of Moose Jaw Normal School 1929-1930; principal of Saskatoon Normal School, 1930-1934. Saskatoon Star Phoenix March 24, 1953. The Story of Lodge Progress No. 92 5663. " unquote page xxv. Digitized online by Google Books 2012. Date accessed May 15, 2013. Initial Training School is Opened Officially Today. First Student Group Marches from Quarters in Normal School to Classes at Bedford Road Collegiate. Saskatoon Star-Phoenix. December 8, 1941. Page 3. Google News Archive. Date accessed May 16, 2013. Inmagic DB/Text WebPublisher. 4 Records. Popular Searches of the Local History Room Collections Database. Quote"... The Normal School on Avenue A (now known as Idylwyld Drive) in Saskatoon opened in 1912 and a third opened in Moose Jaw in 1929. By 19646, student teachers were learning their profession at university.) " unquote Date accessed May 17, 2013. Inmagic DB/Text WebPublisher. 61 Records. Popular Searches of the Local History Room Collections Database. Quote"... Exterior Rear Saskatoon Normal School; Temporary Certificate; " unquote Date accessed May 17, 2013. Inmagic DB/Text WebPublisher. 18 Records. Popular Searches of the Local History Room Collections Database. Quote"... Junior Literary Executive Saskatoon Normal School; Second Class students and staff, Saskatoon Normal School; Graduating Class, Saskatoon Normal School " unquote Date accessed May 17, 2013.
unquote Date accessed May 16, 2013. Inmagic DB/Text WebPublisher:73 records Popular Searches of the Local History Room Collections Database. Quote"Normal School location of Initial Training School No. 7. ...British Commonwealth Air Training Plan operated two schools in Saskatoon during World War II. #7 was housed in the Normal School on Avenue A...#7 I.T.S. operated from December 30, 1941 to June 30, 1944... " unquote Date accessed May 16, 2013. Interesting Exhibits of Work Displayed by Normal School Pupils. Teachers of West Saskatoon Inspectorate in Convention; Many constructive addresses by members of staff. Saskatoon Star-Phoenix. May 15, 1933. Google News Archive. May 15, 1933. Date accessed May 16, 2013. Interim Report of the Superannuation Committee, Normal School, Saskatoon, April 4 1919, (microform) Normal School (Saskatoon, Sask) Superannuation Committee: Free Download and Streaming: Internet Archive Date accessed May 15, 2013. JMU - What's a Normal School? Quote " ...What’s a Normal School? ...it means normal in the sense of setting an excellent model – or “norm” – for other schools. 'Normal Schools derive their name from the French phrase ecole normale. These teacher-training institutions, the first of which was established in France by the Brothers of the Christian Schools in 1685, were intended to set a pattern, establish a “norm” after which all other schools would be modeled.' ..."unquote James Madison University. May 24, 2011. Date accessed May 16, 2013. Kelly, Brendan. A City Reborn: Patriotism in Saskatoon During the Second World War. University of Saskatchewan. Saskatoon. April 2008. Quote " ...W C. P. Seeley, the principal of the Normal School in Saskatoon, ... Speaking to a large crowd at the Vimy Memorial in Kiwanis Park in May 1941..."unquote Date accessed May 16, 2013. Kerr, Don. University of Saskatchewan Archives. Building the University of Saskatchewan. The Beginnings. 1998. Date accessed May 16, 2013. Kerr, Don and Stan Hanson. Saskatoon: The First Half-Century. NeWest Publishers Ltd. Edmonton, Alberta. ISBN 0-920316-35-2 (bound), ISBN 0-920316-37-9 (pbk.) Pages 231, 241-2, 244, 246. 1982. King Edward School closure to be studied further. The Phoenix. March 14, 1979. Page 5. Google News Archives. Date accessed May 20, 2013. Last course for teachers. Normal School in Regina to close. The Leader-Post. September 1, 1944. Date accessed May 16, 2013. Latta Replies to Critics on Schools Policy. And Dr. C.E. Tran, Progressive Leader, Admits He Can't Find Fault with Curricula. The Morning Leader. January 15, 1926. Page 33. Second Section. Google News Archive. Date accessed May 23, 2013. Life Member 2013. Lucienne Déschaine. Quote " ...She went to Normal School in Saskatoon in 1943. Classes began in early July. School board trustees began recruiting prospective teachers by the end of July and throughout August....The Saskatoon East Unit was looking for teachers to supervise Normal School students. She applied and was assigned to Blackstrap School, a rural school in Dundurn. The job was quite demanding. Three groups of two student teachers arrived in the fall and again in the spring. The students were expected to observe in the fall and to do some planning as well as teaching in the spring. "unquote James Madison University. May 24, 2011. Date accessed May 16, 2013. Permanently Settled in Saskatoon. Saskatoon Star-Phoenix. February 9, 1959. Page 12. Date accessed May 17, 2013. The light Saskatoon Normal School, The light (Peel 10193 Provincial Normal School (Saskatoon, Sask.). Provincial Normal School, Saskatoon, Sask. : 1931-1932. [Saskatoon: Provincial Normal School, 1932]. Complete yearbook online. Physical description: 24 p. : ill., ports. ; 27 cm. Language: English On cover: "Souvenir." Content is similar to a conventional yearbook, but seems likely to have been issued as a separate commemorative item. The Normal School’s standard yearbook - The light, [Saskatoon]: [Saskatoon Normal School], [19--? ]- - is described separately in the bibliography. 2003-2009 | University of Alberta. Date accessed May 15, 2013. Local Normal School. Several Desire It - Other Applications Should be Sent in Now. The Daily Phoenix. August 20, 1909. Google News Archive. Date accessed May 16, 2013. Look Over Public School Property. Education Heads Here in Regard to Proposed Transfer of Normal School. Saskatoon Star-Phoenix. August 23, 1941. Google News Archive. Date accessed May 16, 2013. Lord, Alexander Russell. Alex Lord's British Columbia: Recollections of a Rural School Inspector, 1915-1936. Pacific Maritime Studies Series / University of British Columbia. Recollections of the pioneers of British Columbia. Volume 9 of The Pioneers of British Columbia, ISSN 0847-0537. Editor	Calam, John. Edition	illustrated. Publisher	UBC Press, 1991. ISBN	0774803851, 9780774803854. Page 8. Digitized online by Google Books. Date accessed May 17, 2013. Lyons, J. The Saskatchewan Way: Henry James and Curriculum Reform in Saskatchewan. Noonan, Brian W.; Dianne M. Hallman, and Murray Scharf; editors. The History of Education in Saskatchewan: Selected Readings Volume 47 of Canadian plains studies. Contributors	Brian W. Noonan, University of Regina. Canadian Plains Research Center. Edition	illustrated. Publisher	University of Regina Press, 2006. ISBN	0889771901, 9780889771901. Digitized online by Google Books. Quote "The province [was kept] in a state of teacher shortage until the mid-1970s. Because the government continued to issue temporary certificates to applicants who had completed one year of normal school, many high school graduates saw the profession as a convenient short term job prior to marriage or another career. In 1947, for example, 1,264 students were enrolled in normal school, but there were only 5,869 students in grade twelve...Although the provinces' Normal Schools in Regina, Saskatchewan and Moose Jaw had been renamed Teachers' Colleges, they had remained under Department of Education jurisdiction. In 1964 all teacher education was consolidated at the University of Saskatchewan campuses in Regina and Saskatoon..."unquote Page 56 and 60. Date accessed May 16, 2013. Manzer, Ronald A. Educational regimes and Anglo-American democracy. Volume 18 of G - Reference, Information and Interdisciplinary Subjects Series. Volume 18 of Studies in comparative political economy and public policy, ISSN 1714-9339. Edition	2, illustrated. Publisher	University of Toronto Press, 2003. ISBN	0802087809, 9780802087805. Digitized online by Google Books. Quote "George Weir, minister of education in British Columbia from 1933 to 1941 and again from 1945 to 1947, had been principal of Saskatoon Normal School, director of teacher training at University of British Columbia, and joint director of teacher training at University of British Columbia, and joint author with J.H. Putman of the seminal survey of British Columbia education in 1925. "Unquote Page 97, 221, 426 Date accessed May 15, 2013. March, Ann. Webster, David (1885–1952). The Encyclopedia of Saskatchewan. Canadian Plains Research Center. University of Regina. 2006. QuoteBorn in 1885, David Webster was one of Saskatoon’s first architects... Post-war projects included the .... Saskatchewan Normal School, "unquote Date accessed May 16, 2013. Normal Schools - ca. 1900-1947 - Saskatoon Normal School Photograph SAIN Photographs. Saskatchewan Archival Information Network. Date accessed May 15, 2013. Maurice W. Sharon Family, 1875- SAIN Collections. Saskatchewan Archival Information Network. QuoteSharon remained in private practice until 1916, when he was appointed Provincial Architect with the Department of Public Works. Sharon prepared plans and specifications and supervised the construction of many of Saskatchewan's public buildings, including the Provincial Normal School in Saskatoon. "unquote Date accessed May 16, 2013. McCarthy alarmed over teacher shortage. Regina School should be used. The Leader Post. February 14, 1951. Google News Archive. Date accessed May 20, 2013. Miss Wynona Mulcaster Appointed Art Teacher at Normal School here. Saskatoon Star-Phoenix. April 7, 1945. Google News Archive. Date accessed May 16, 2013. M.L.A. 's discuss teacher problem. Normal School Discussed Again. The Leader-Post February 22, 1951. Google News Archive. Date accessed May 16, 2013. More than One New District per day formed. Thirty Two school Districts were Erected in Saskatchewan During March. The Morning Leader. April 7, 1914. Page 4. Google News Archive. Date accessed May 23, 2013. Must Raise Standards of Service. Seeley Gives Address on Citizenship to United Clup Group. Over 400 present. Essential Canada Control Problems of Economics, Creed and Race. Saskatoon Star-Phoenix. February 2, 1937. Page 4. Google News Archive. Date accessed May 16, 2013. Next Normal School to be in Saskatoon. Premier Scott States this as his personal opinion. The Saskatoon Phoenix. May 3, 1913. Google News Archives Search. Quote" "At Regina, where a normal school has been conducted for ages, there is no building yet; but one is now being erected. ...My impression is that the next normal school will be in Saskatoon. That is a certainty," said Hon. Walter Scott, premier of Saskatchewan. "unquote Date accessed May 16, 2013. New Normal School Staffs Are Announced. Many Changes in Personnel Necessitated by Establishment of School at Moose Jaw. The Morning Leader September 24, 1927. Page 17. Date accessed May 16, 2013. Normal School Accommodation. The Morning Leader. September 12, 1927. Page 4. Google News Archive. Date accessed May 20, 2013. Normal Students Hold Interesting Debate on Friday. Saskatoon Star-Phoenix. November 7, 1931. Page 8. Google News Archive. Names of debating club are recorded. Date access May 20, 2013. Normal School, Saskatoon, Sask. 5 December 1950 postcard photograph circa 1940s- Wish You Were Here Saskatchewan Postcard Collections University of Saskatchewan Archives. 2010. Date accessed May 15, 2013. Normal School Appointments are Announced. Principal at Saskatoon Will Be Replaced by Public Schools Superintendent. The Morning Leader. September 12, 1927. Page 10. Google News Archive Search. Quote Dr. J.S. Huff, principal of Saskatoon Normal School, has been appointed principal of the new Normal School at Moose Jaw....Dr. J.A. Snell, superintendent of public schools at Saskatoon, has been appointed to succeed Dr. Huff as principal of the Saskatoon Normal School...In 1915 he became principal of the Regina Normal School..."unquote Date accessed May 16, 2013. Normal School Enrollment 500. The Leader Post. October 19, 1948. Google News Archive. Page 2. Date accessed May 24, 2013. Normal School Here Jan. 5 to be Largely Attended. Sessions Open to Teachers who have completed Third Year Course in Normal. The Morning Leader. December 26, 1919. Google News Archives. Date accessed May 16, 2013. Normal School Planning Another Short Session. Saskatoon Star-Phoenix. December 18, 1929. Page 3. Google News Archives. Date accessed May 16, 2013. Normal School Results. Saskatoon Star-Phoenix. July 19, 1932. Google News Archives Search. Date accessed May 16, 2013. Normal School Session Begins January 3rd. The Saskatoon Star-Phoenix. November 30, 1916. Google News Archives Search. Date accessed May 16, 2013. Normal School Session Dates Are Announced. The Second Normal School Sessions for First, Second, and Third Class will commence Jan. 6 The Saskatoon Phoenix. October 25, 1919. Google News Archives Search. Date accessed May 16, 2013. Normal School Sessions Open September First. Bona Fide Saskatchewan Residents and University Graduates Only Accepted. Training will be Given in Saskatoon, Regina. The Morning Leader. June 19, 1926. Page 17. Google News Archives Search. Date accessed May 16, 2013. Normal School Staff and Students Hold Memorial Service for the King. Saskatoon Star-Phoenix. January 21, 1936. Google News Archives Search. Date accessed May 16, 2013. Normal School Staff to Hold Meetings. Schedule Drawn up Starting May 15 at Rosetown for Teachers in Rural Districts. The Saskatoon Phoenix. May 2, 1913. Google News Archives Search. Date accessed May 16, 2013. Normal School, Saskatoon Sask. circa 1922-1932 Postcard. - Wish You Were Here Saskatchewan Postcard Collections University of Saskatchewan Archives. 2010. Date accessed May 15, 2013. Normal School Work Extending. Training for First Class Certificates to be Given - Advantage of Having University Here. The Saskatoon Phoenix. December 18, 1912. Google News Archive. Date accessed May 15, 2013. Normal Students Choose Officers. Seventeen Nominated Friday for Four Vacancies on Assembly Executive. Saskatoon Star-Phoenix. January 12, 1935. Page 4. Google News Archive. Date accessed May 20, 2013. Normal Students Plan Activities. Saskatoon Star-Phoenix. Page 6. September 12, 1939. Quote "The 355 young men and women registered at the Saskatoon Normal School heard the constitution read and the nature of activities outlined at the first meeting of the Students Assembly Friday after noon in the auditorium..."unquote Google News Archives. O'Brien, Jeff; Ruth W. Millar and William P. Delaney. Saskatoon: A History of Photographs Edition	illustrated. Publisher	Coteau Books, 2007. ISBN	1550503669, 9781550503661. Page 72. Digitized online by Google Books 2012. Quote "A second BCATP (British Commonwealth Air Training Plan facility ` the NO. 7 Initial Training School - opened in 1941 next to the Normal School on Avenue A on the site of the present Kelsey Campus of SIAST. ...New hangars and barracks were built at the airport and next to the Normal School to accommodate the BCATP trainees. ...With university residences overflowing, the barracks of the former BCATP schools at the airport and by the Normal School on Avenue A accommodated the expanded student population....the Normal School (now the A.E. Davies Centre) on Avenue A..."unquote Pages 50, 72, 74 Date accessed May 15, 2013. One New School District a Day. That was Record of Education Department For September". The Morning Leader. October 2, 1913. Google News Archive. Date accessed May 23, 2013. Only Yesterday. Thirty Years Ago (1935) Saskatoon Star-Phoenix. Page 15. Google News Archive. Quote "C.P. Seeley, principal of the Saskatoon Normal School, said probably 25 percent of those students wishing to enter the teaching profession were not fitted to the job and would be well advised to seek some other line of work...."unquote Date accessed May 20, 2013.
unquote Date accessed May 17, 2013. Opening of Normal School Suggested. February 24, 1951. Page 7. Google News Archive. Date accessed May 20, 2013. Outstanding educational facilities abound in Saskatoon. Saskatoon Star-Phoenix. Page 43. May 19, 1966. Google News Archive. Date accessed May 17, 2013. Phillips, John M> Saskatoon Hub City of the West. First Edition. Windsor Publications (Canada) Ltd. Canada. Page 37, 47, 66. 1983. Postcard 2891: Novelty Mfg. & Art Co., Ltd, Souvenir Saskatoon, Sask., Canada (c1939) Specifically: PC002891.6. Novelty Mfg. & Art Co., Ltd (Publisher) . Normal School, Saskatoon, Sask.. Montreal: Novelty Mfg. & Art Co., Ltd. Montreal, c1939. PC002891: "Souvenir Saskatoon, Sask., Canada" is licensed by University of Alberta Libraries under the Attribution - Non-Commercial - Creative Commons license. Permissions beyond the scope of this license may be available at http://peel.library.ualberta.ca/permissions/postcards.html. Date accessed May 16, 2013. Provincial Normal School, Saskatoon Staff, and exterior views of the Saskatoon Normal School 1030 Avenue A North (now Idylwyld Drive) constructed between 1920-1922 by A.W. Cassidy, contractor. Normal School used to train military personnel, cadets and officers in flight courses for the Royal Canadian Air Force during World War II, during this time Governor- General Viscount Alexander of Tunis and his wife, Lady Margaret Alexander visited the Normal School at the time when Mayor Angus Macpherson was installed for the city of Saskatoon. Popular Searches of the Local History Room Collections Database. Saskatoon Library. Date accessed May 15, 2013. Provincial Normal School Examination Results Announced. Regina, Saskatoon, and Moose Jaw Students to Get Interim Certificates. The Leader-Post. July 13, 1934. Google News Archive. Date Accessed May 16, 2013. R.R. Knight Gives Advice to Normal School students. Saskatoon Star-Phoenix. Page 5. November 22, 1947. Google News Archive. Date Accessed May 16, 2013. Regina Normal School Will Be Closed Soon. September 1, 1944. Page 3. Google News Archive. Date accessed May 20, 2013. Retired Teacher Dies at Coast. [Dr. Steinn W. Steinson] The Leader-Post. September 26, 197. Page 3. Google News Archive. Date accessed June 4, 2013. Room J of the Saskatoon Normal School at the wiener roast on the river bank near Yorath Island, Sept. 16, 1930. SAIN Saskatchewan Archival Information Network Photographs. Date accessed June 25, 2013. Russell, E.T. Pete. The history of North Park : circuses, railways and the vanishing prairie. Saskatoon : Modern Press, [c1975]. Saskatchewan Settlement Experience. Saskatchewan Archives Board 2005. Quote "The Yorkton and Regina Normal Schools were the precursors to the Colleges of Education that were eventually established at the Universities. With such a high demand for teachers, the Normal Schools were used to give a basic amount of training in the shortest time possible before the teachers were dispersed to the many rural areas of the province....."unquote Date accessed May 16, 2013. 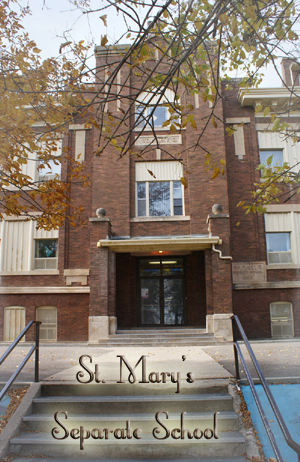 St. Mary's Community School | The Heritage Canada Foundation. 2012. Date accessed May 17, 2013. 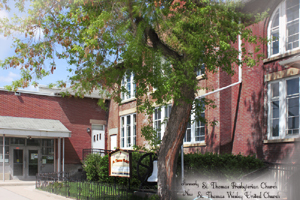 St. Thomas Wesley United Church - Our History 2010. St. Thomas Wesley United Church. Date Accessed May 17, 2013. Saskatchewan Teachers' College Gave Last of 20,588 Certificates. Saskatoon Star-Phoenix. June 20, 1964. Page 13. Google News Archive. Date accessed May 17, 2013.
unquote Google News Archive. Date accessed May 20, 2013. Saskatoon has builded wisely. Metropolis of Central Saskatchewan Contains Modern Structures of Every Type- In Architectural Design and Finish they will compare very favorably with the older cities in Canada - is a city of homes. The Saskatoon Phoenix. December 4, 1913. Page 18. Google News Archive. Date accessed May 17, 2013. Saskatoon Panel "Takes a Look at our High Schools." Saskatoon Star-Phoenix. November 24, 1955. Google News Archive. Date accessed May 17, 2013. Saskatoon school to use TV aid to teacher training. The Financial Post. April 11, 1964. Page 53. Google News Archive. Date accessed May 17, 2013. Sass, Sean editor. Community. Buena Vista School History. Quote"The School is Opened: 1913 - 1914. The cornerstone was laid by school board secretary W.P. Bate on June 9, 1913. The cornerstone contains copies of the two daily newspapers of the time, the Daily Star and the Phoenix, as well as photographs of the city. Six rooms opened in the school on April 1, 1914 and six more rooms opened in September of that year. Four of the rooms were rented to the Normal School, the teacher’s college...." unquote Date accessed May 16, 2013. Scharf, M.P. An Historical Overview of the Organization of Education in Saskatchewan. Noonan, Brian W.; Dianne M. Hallman, and Murray Scharf; editors. The History of Education in Saskatchewan: Selected Readings Volume 47 of Canadian plains studies. Contributors	Brian W. Noonan, University of Regina. Canadian Plains Research Center. Edition	illustrated. Publisher	University of Regina Press, 2006. ISBN	0889771901, 9780889771901. Digitized online by Google Books. Quote "The selection of textbooks, enforcement of regulations, school attendance, teacher certification, normal schools, teacher institutes, examinations, inspection of schools, and curriculum, however were matters left under the authority of the Council of Public Instruction. In 1901 the Council of Public Instruction was abolished and the Department of Education was established with responsibility with the control and management of all kindergarten schools, public and separate schools, normal schools, teachers' institutes, and the educations of the deaf and blind persons...."unquote Page 5. Date accessed May 16, 2013. School Enrollment For January Biggest Yet in History of Regina. During Past Month 6,616 Pupils were enrolled, an increase over January 1927, of 323 students. The Morning Leader. February 14, 1928. Page 24. Date accessed May 24, 2013. School Enrollment for Saskatchewan Increases Rapidly. Elementary Schools Show Greatest Growth, Education Report Shows. The Morning Leader. February 17, 1930. Page 3. Google News Archive. The Training, Crediting and Certification of Teachers, Inspector J. Arch, McLeod, Dr. J.A. Snell. ..."unquote Page 5. Date accessed May 16, 2013. Date accessed May 23, 2013. Scholarship Winners at Teachers College. (image) Saskatoon Star Phoenix. June 12, 1958. Google News Archive. Date accessed May 17, 2013. Student Teachers Get Scholarships. (image) Teachers Meeting Here on June 25. Saskatoon Star-Phoenix. June 14, 1956. Google News Archive. Date accessed May 17, 2013. School Inspectors Holding Convention Saskatoon, Easter. The Leader. The Morning Leader. February 18, 1918. Page 8. Google News Archive. Date accessed May 16, 2013. Secondary Sources about U of S History:: University of Saskatchewan Archives. Selected Bibliography. Affiliated Institutions. QuoteCampbell, Eleanor. Reflections of Light: A History of The Saskatoon Normal School (1912-1953) and The Saskatoon Teachers' College (1953-1964). Saskatoon: College of Education, University of Saskatchewan, 1996. "unquote University of Saskatchewan Archives. 07-Apr-2013 Date accessed May 16, 2013. Social and Personal. Saskatoon Star-Phoenix. March 7, 1946. Page 8. Google News Archives. Quote"Ferns and flowers decorated the Saskatoon Normal School auditorium Friday evening when students gathered for their second large social of the year. "unquote Date accessed May 23, 2013. Statistics Canada: Canada's National Statistical Agency. Canada Year Book 1905. pdf file. Canada Year Book CYB Historical Collection. Page 11. Archived content online 2009-06-09. Government of Canada. Date accessed May 23, 2013. Statistics Canada: Canada's National Statistical Agency. Canada Year Book 1912. pdf file. Canada Year Book CYB Historical Collection. Page 19. Archived content online 2009-06-09. Government of Canada. Date accessed May 23, 2013. Statistics Canada: Canada's National Statistical Agency. Canada Year Book 1916-1917. pdf file. Canada Year Book CYB Historical Collection. Page 74. Archived content online 2009-06-09. Government of Canada. Date accessed May 23, 2013. Statistics Canada: Canada's National Statistical Agency. Canada Year Book 1919. pdf file. Canada Year Book CYB Historical Collection. Page 128. Archived content online 2009-06-09. Government of Canada. QuoteIn general there are two fundamental systems of education throughout Canada, one that of the Protestant communities, free from the control of religious bodies, and the other that of the Roman Catholic French and Irish communities in which education is united with the religious teachings of the Roman Catholic Church. "unquote Date accessed May 23, 2013. Statistics Canada: Canada's National Statistical Agency. Canada Year Book 1931. pdf file. Canada Year Book CYB Historical Collection. Page 124. Archived content online 2009-06-09. Government of Canada. Date accessed May 23, 2013. Statistics Canada: Canada's National Statistical Agency. Canada Year Book 1941. pdf file. Canada Year Book CYB Historical Collection. Page 48, 879 Archived content online 2009-06-09. Government of Canada. Date accessed May 23, 2013. Statistics Canada: Canada's National Statistical Agency. Canada Year Book 1951. pdf file. Canada Year Book CYB Historical Collection. Page 112, 121, and 122. Archived content online 2009-06-09. Government of Canada. Date accessed May 23, 2013. Statistics Canada: Canada's National Statistical Agency. Canada Year Book 1961. pdf file. Canada Year Book CYB Historical Collection. Page 340. Archived content online 2009-06-09. Government of Canada. Date accessed May 23, 2013. Steffenhagen, Janet. Enrollment, tax benefits seen if King Edward School closes. The Phoenix. March 18, 1978. Page 61. Google News Archive. Date accessed May 20, 2013. Student Teacher Executive (image) Saskatoon Star-Phoenix. February 21, 1964. Page 22. Google News Archives. Date accessed May 17, 2013. STF Day - Saskatoon Teachers' College 1962-63 - Audience - SAIN Saskatchewan Archival Information Network. Date accessed May 17, 2013. Study Curriculum At Sessions Here. School Superintendents and Normal School Teachers Attend Conference. Saskatoon Star-Phoenix. August 27, 1941. Google News Archive. Page 3. Date Accessed May 20, 2013. Successful Students in Normal School "Exams" for Third Class Licenses. The Morning Leader. February 11, 1926. Google News Archives. Date Accessed May 16, 2013. Tenders Being Called for New Normal School. Cost of the Building Estimated at about $500,000 - A Magnificent Site. Will Overlook Saskatoon City from West Side at Top of Avenue A. The Morning Leader. June 7, 1920. Page 17. Google News Archives. Date Accessed May 16, 2013. Teachers Affect Eternity Anderson Tells Graduates. Not Merely Livelihood. Saskatoon Star-Phoenix. June 20, 1946. Page 3 and 5. Google News Archive. Date accessed May 23, 2013. Teacher's College Graduates. "You are handling Most Precious Commodity" Douglas tells Teachers College Graduates. Saskatoon Star Phoenix. June 12, 1959. Google News Archives. Date Accessed May 17, 2013. Teachers college renamed. The Phoenix. February 11, 1986. Page 34. Google News Archives. Date Accessed May 17, 2013. Teachers Graduate Next Week. Largest Class Ever. Saskatoon Star-Phoenix. June 3, 1960. Page 19. Google News Archives. Date Accessed May 17, 2013. Tests to Weed Out Teachers. Twenty Five Percent Starting Normal Courses Unfitted, Says Principal. The Leader-Post. August 7, 1935. Google News Archives. Date Accessed May 16, 2013. Third Avenue United Church History of Third Avenue United Church. Dec 16, 2012. Quote"Over the years many graduates of the University of Saskatchewan, the Normal School, and City Hospital nurses' training program convocated here. "unquote Date accessed May 16, 2013. Three-Year Teachers College Course Recommended Here. May Soon Have Two-Year Teacher Training in Sask. Saskatoon Star-Phoenix. April 1, 1959. Page 19. Google News Archive. Date accessed June 4, 2013. To Change School Boundaries [reference North Park and Wilson Schools] Saskatoon Star-Phoenix. August 25, 1954. Google News Archive. Date accessed May 20, 2013. Third Class Normal School Session Opens Jan. 3 The Saskatoon Phoenix. November 20, 1916. Page 3. Google News Archive. Date accessed May 20, 2013. University of Saskatchewan Archives - Building the University of Saskatchewan. Campus Buildings. Qu'Appelle Hall. Date accessed May 16, 2013. Vintage Saskatoon Quote Cone Patricia. "We called it "the Teacher's College". It became officially "The Avenue A Campus of the U. of S." sometime before the Education Building was built and opened. ""unquote Date accessed May 16, 2013. University Registrations Rush Expected on Monday. Saskatoon Star-Phoenix. September 12, 1964. Google News Archive. Date accessed May 17, 2013. Varsity View History - Varsity View Yesterday and Today draft City of Saskatoon, Community Services, Planning Department, Neighborhood Planning, Varsity View. September 30, 2011. Quote Cone Patricia. " 1110 Elliot Street: Teacher’s Hostel. The teacher’s hostel located at 1110 Elliot Street was built prior to 1913 by Thomas E. Farley and designed by Thomson and Crockart. The structure was built near the university to house young female teachers who were from out of town and were attending Normal School. When the Normal School opened a new building on Avenue A (now Idylwyld Drive), the residents of the hostel were relocated to be closer to the school. From 1925 to the mid 1970’s, 1110 Elliot Street served as a lodge for the staff of Emmanuel College and the hostel was renamed the Emmanuel Annex. Today, the house is a private residential dwelling and an integral part of Saskatoon’s history"unquote Date accessed May 16, 2013. WDM Prairie Gamble - Family History Album - WHEATON family. 2001-2013 Western Development Museum. Quote "The Wheaton Electric did the electrical work in many buildings including the Saskatoon Normal School 1924..."unquote Date accessed May 16, 2013. WDM Prairie Gamble - Family History Album - MARTIN, John Russell and Janet Mabel (Wilson). 2001-2013 Western Development Museum. Quote "During the Second World War many teachers had enlisted for active war duty, which resulted in an acute shortage of qualified teachers. To alleviate this shortage, short courses at the provincial normal schools were organized, sometimes just six weeks in length. For some “study supervisors”, as the graduates were called, this became their only training..."unquote Date accessed May 16, 2013. WDM Prairie Gamble - Family History Album - PODILUK, Walter, Family. 2001-2013 Western Development Museum. Quote "In September 1945, I enrolled in the Saskatoon Normal School to commence my training to become a teacher. The Normal School academic year extended from September to June inclusive, which resulted in one gaining an Interim Standard Teaching Certificate. However, partly due to the drainage of young people into the armed forces there was a pronounced shortage of teachers in rural schools. As a result some students were selected to go teaching in January 1946 to fill vacancies, which existed in rural schools. Those that left in January could come back in July and August and complete their program for their Interim Certificate. .."unquote Date accessed May 16, 2013. When Saskatoon Was Younger. From the Files of the Phoenix and the Star. Twenty Years Ago. February 24, 1919. Saskatoon Star-Phoenix. February 24, 1939. Google News Archive. Quote "G.M. Weir, Principal of the Saskatoon Normal School, said the location of the new normal school would be decided in a few days.~ .."unquote Date accessed May 16, 2013. When Saskatoon Was Younger. From the Files of the Phoenix and the Star. Twenty Years Ago. August 16, 1924. Saskatoon Star-Phoenix. August 16, 1944 Google News Archive. Quote "August 15, 1925 Work was progressing on the new Teacher's hostel on Avenue A. near the Saskatoon Normal School.~ .."unquote Date accessed May 16, 2013. Work on Display at Normal School. Extension Service in Evidence; Teachers Addressed by Dr. Anderson. Saskatoon Star-Phoenix. May 12, 1933. Google News Archive Search. Date accessed May 16, 2013. Walter Murray; The Lengthened Shadow. Applications and Appointments - J.A. Snell Correspondence relating to Joseph A. Snell of Macdonald College, Quebec, seeking employment at the University. In 1914 Snell was appointed Lecturer on Education. University of Saskatchewan. 2011. Date accessed May 17, 2013. Weir Leaves Trustee Body. Former Saskatonian Directs Rehabilitation Group of Federal Department. Saskatoon Star-Phoenix. June 3, 1942. Google News Archive. Date Accessed May 20, 2013. What Makes Saskatoon Grow? Saskatoon Star-Phoenix. September 28, 1946. Page 13. Google News Archive. Date accessed May 20, 2013. Wilson School Grounds Saskatoon Star-Phoenix. August 29, 1931. Page 3. Google News Archive. Date Accessed May 20 2013. Women's Page. Some Progress in Education. Saskatoon Star-Phoenix. March 28, 1949. Page 9. Quote"Dr. G.R. Anderson, principal of the Saskatoon Normal School gave a most interesting address...under the title, "What Progress Education in Our Society?" He traced briefly how great incidents and great thinkers had gradually moulded a line of thought in education...." unquote Google News Archive. Date accessed May 20, 2013. Worden, Dan. An Apple for the Teacher (William Holliston) Saskatoon Star-Phoenix. April 8, 1950. Page 17. Google News Archives. Date accessed May 17, 2013.